Do you wear video game themed or inspired clothes? I sure do! And a FATAL FURY hat. I have pinball and arcade t-shirts. I had to laugh one day I was wearing my Shark Jaws t-shirt and some guy asked me if I was a diver. I don't, I feel to old to wear vg shirts, not sure where you buy them anyway. I've worn event shirts though, like Retro FX / Pinburgh, which prompted people to approach me to talk. 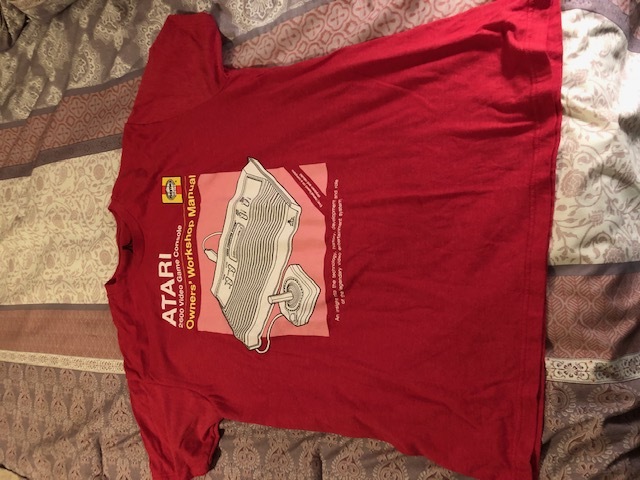 My wife has bought me some "Atari" t-shirts she found at Target. I wear them occasionally.. usually around the house only though. 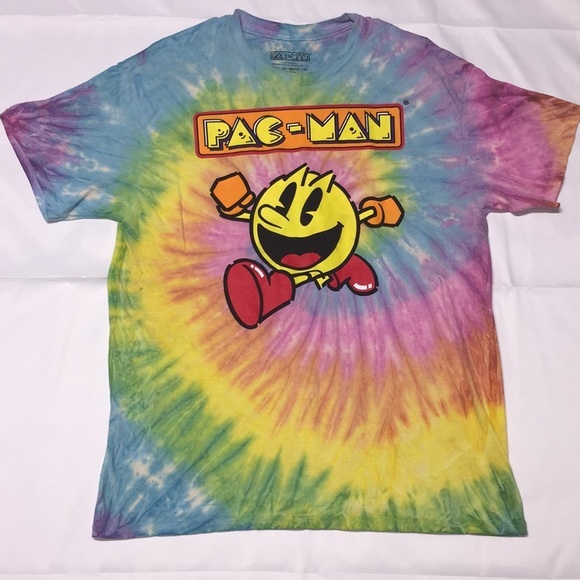 I have 2-3 different Pac-Man shirts. 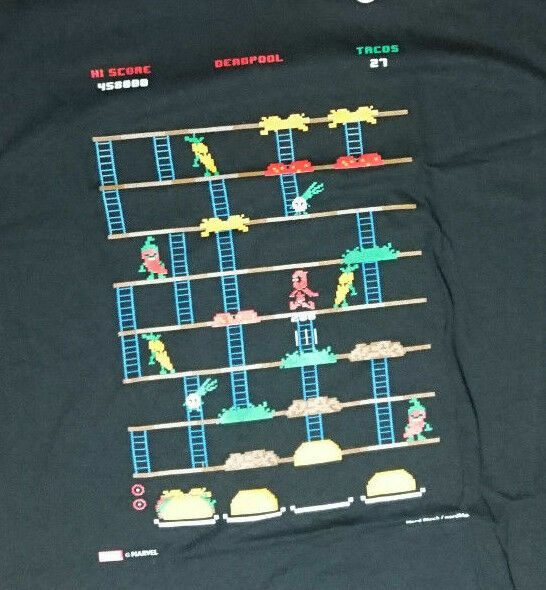 I recently got a Burgertime/Deadpool crossover shirt I love (Taco Time!). 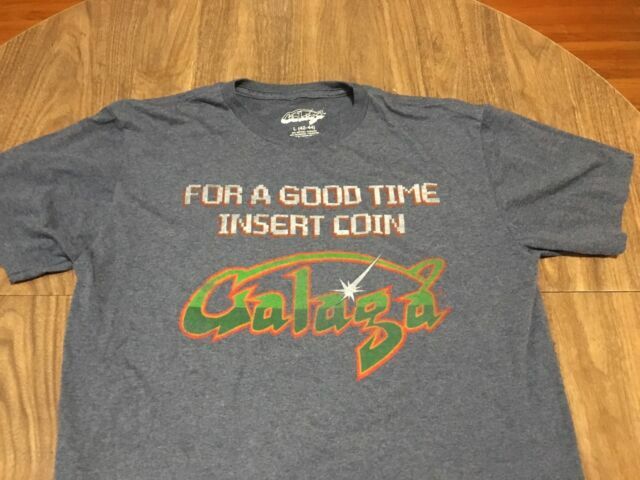 My wife has a Galaga "For a good time insert coin" shirt she has worn out. Most of my t-shirts and flannel PJ pants I wear around the house are video game themed. I have several Atari ones, Galaga, and a few Sega apparel. I work at home 99% of the time, so I have a closet of t-shirts. They're a mix of both video game and movie/cartoon stuff and overlap too because of licensing. Typically at night I have some 80s style TMNT sleep pants with all four of their heads on there, and right now a sort of worn out 8bit pixel Mario shirt (which replaced a GIJoe Cobra emblem shirt.) The closet has newest now an original SMB1 art jumping Mario shirt for example, and I have a couple other 8bit Mario shirts and one of him with a hammer from Paper Mario GC. Then I have an 8bit Metroid box art shirt, and the Japanese Super Metroid III art shirt, and a couple pokemon shirts (1 pikachu, then one of him + 3 original starters) and there's randomly other stuff (captain america shield, masters of the universe, etc.) Right now wearing a Jurassic Park emblem shirt they reissued for the Lost Kingdom release. oh! 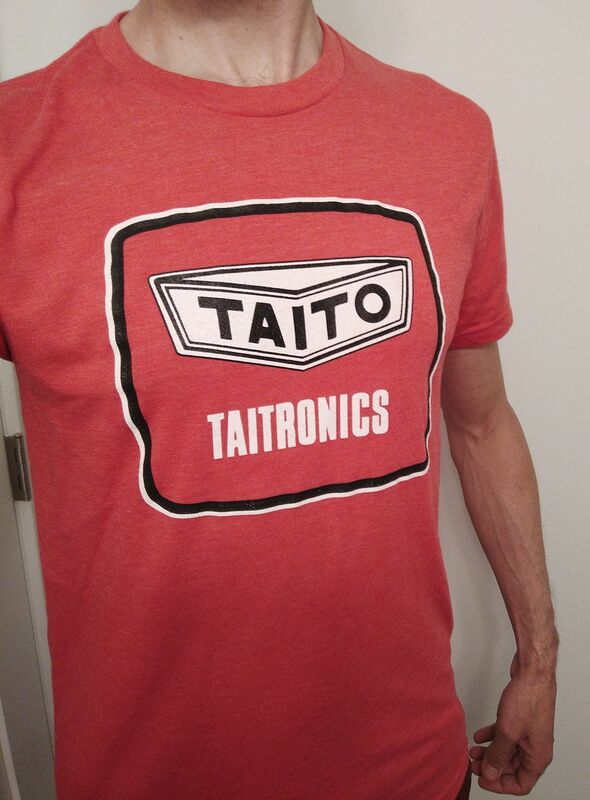 I forgot about my Taito T-shirt in Space Invaders Pt. 2 red.. I love the darn thing. I'm wearing an Atari Represent shirt right now. Not really- but not by choice, mind you. 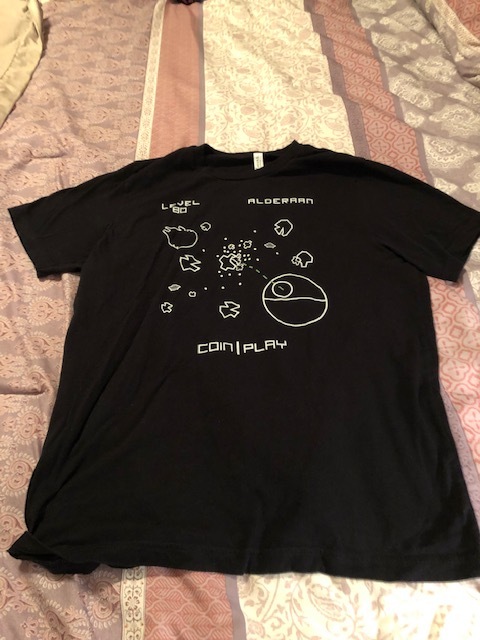 It is remarkably difficult to find comfortable nerd t-shirts for me. Either they're designed for tiny Chinese women & would never fit me, or they're cut for men & don't sit correctly. Even if I could fine them, my job doesn't allow for a lot of t-shirt wearing to begin with. What I'd really like are nice blouses that just happen to be gamey in some way, like all-over prints that, upon closer inspection, are pac-man mazes or rupees. I graviate toward bell-sleeved babydoll tops, which tend to have brocade ribbon accents down the front. If that ribbon was the scarf from Journey I'd go nuts! I have at least a dozen retro game themed T-shirts that I wear regularly. I also have a golf shirt with an embroidered Jaguar logo that I have worn a few times in the office. 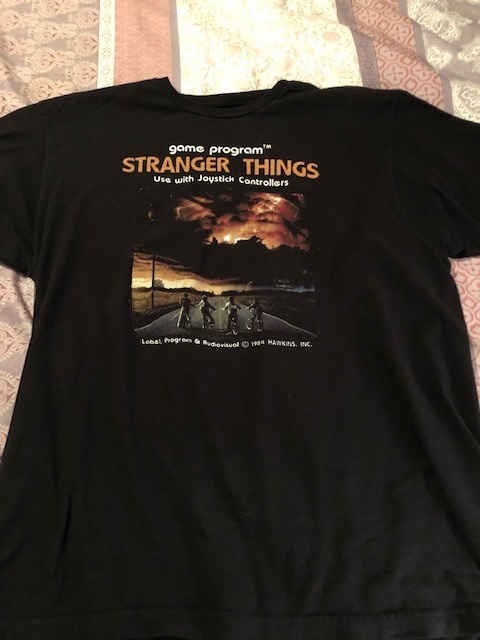 Wow, some great shirts in this thread! 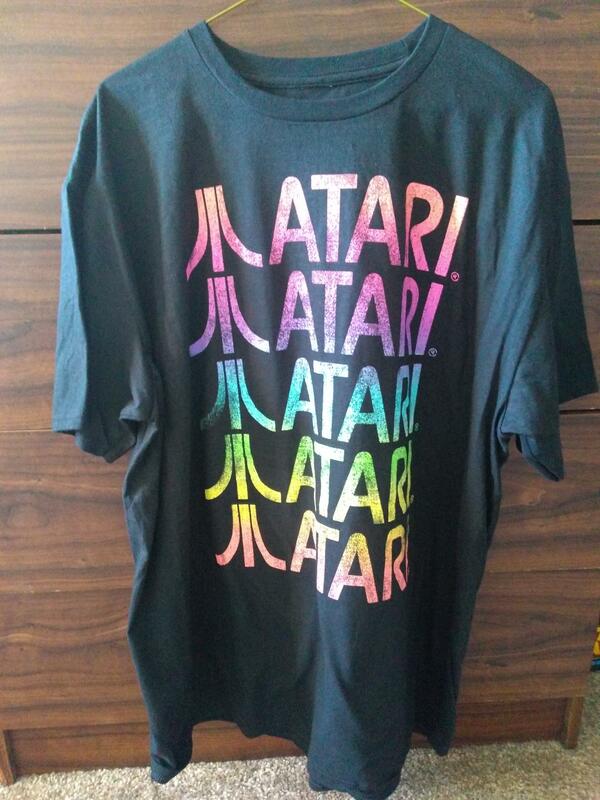 I have worn them ever since the retro Atari logo shirts became somewhat popular in the late 90s. I only wear the retro gaming shirts, but usually on around Christmas most times. Makes me feel like a kid again, lol. I've added quite a few recently though as Walmart now has stocks of random shirts. But a real pain to dig through them all to find them in my size! What started it was a random official NES SMB box art shirt, on black. I have one similar from way back but on a more blue back ground. This black one was perfect, but none in my size. Those marketing geniouses did two things...now I always check for that shirt, and in doing so I find other cool styles that come home with me...mostly retro stuff. NASA shirts, DnD stuff...old Star Wars, Rubicks...Pac Man. Best part, they're like 11 bux CDN! Some even less. Not all are top quality thickness but some are. Check it out if you're into that. Will post some pics here of my collection. I have many(10-12) "Atari" shirts and sweatshirts in various colors and styles. I have a couple sweatshirts with Actvision games on them as well. I probably wear one at least once a week. I have a few, though it's hard to find stuff in 3x. 2x tees tend to ride up my beer gut, though I still have a few in my closet. Hopefully I lose some weight and eventually can wear them again. I'm 5'11" but my armspan is 6'4", because I have an elongated torso, so I tend not to wear tees that often anymore, since almost noone makes graphic tees in a tall size. Yup, heaps of gaming shirts and even socks, the latest being Barnstorming and Pitfall ones. Got a Space Invaders onesie, and a Space Invaders tee. I don't actively pursue then, but I got some vg themed shirts. Pac Man is the latest one, where I work, clothing doesn't matter as we wear so much protective crap, so I wear it in regular rotation with any of my other clothes. Had a Midwest classic gaming shirt (02 or 03) but last year it decided to self destruct in the wash. Got an "army of 2600" shirt, does that count? I wouldn't say never, but rarely. Frankly, most of them are not very stylish IMO. And once you reach a certain point in your life, graphic tees start to look a little juvenile. This, however...I like this. It would go great with something like a white hoodie and a pair of Wayfarers! And once you reach a certain point in your life, graphic tees start to look a little juvenile. Been thinking the same recently. Is it still OK to wear music related t-shirts though? I really like my Joy Division t-shirt. Music tees can be pulled off if the design is really cool or unusual, or the band is just obscure enough to demonstrate that your taste in music extends beyond the bands whose t-shirts you find at Target (Joy Division is a good example, BTW ). Or if you totally go the other way and rock something unexpected, like the Bee Gees, Huey Lewis, or Fine Young Cannibals, although that can tread dangerously close to Hipster/Douche territory--be careful. Generally, IMO it's probably best to just stay away from music tees. Especially if you're not 17 anymore. What's wrong with looking a little juvenile..? Got a pixelated Mario (from SMB) t-shirt on that I forgot to mention; I also have a 1up mushroom shirt, an NES controller shirt and an Atari logo shirt.